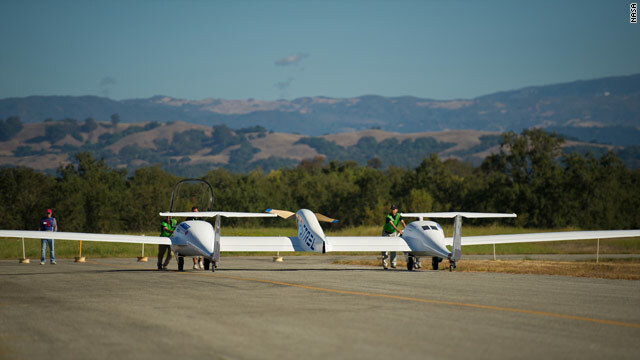 The Pipistrel USA Taurus G4, a four-seat, twin-fuselage aircraft, earned the $1.35 million first prize from NASA. The plane developed by Pipistrel doubled the fuel efficiency requirement for the competition - flying 200 miles in less than two hours while using less than a gallon of fuel per occupant or the equivalent in electricity. The winning plane used a little more than a half-gallon of fuel per passenger for the 200-mile flight. "Two years ago the thought of flying 200 miles at 100 mph in an electric aircraft was pure science fiction," Jack W. Langelaan, team leader of Team Pipistrel-USA.com, said in statement. "Now, we are all looking forward to the future of electric aviation." Second place, and a $120,000 prize, went to Team eGenius of Ramona, California, whose leader, Eric Raymond, congratulated Team Pipistrel. The winning aircraft, the Pipistrel Taurus G4, is a four-seat, twin-fuselage aircraft powered by a 145-kilowatt brushless electric motor driving a two-blade propeller mounted on a spar between the fuselages. The plane's wingspan is about 75 feet. "I'm proud that Pipistrel won. They've been a leader in getting these things into production, and the team really deserves it, and worked hard to win this prize," Raymond said in a NASA statement. "Electric aircraft have moved beyond science fiction and are now in the realm of practice," Joe Parrish, acting chief technologist at NASA headquarters in Washington, said in a statement. The planes flew last week out of Charles M. Schulz-Sonoma County Airport in California. Only three of the 14 entrants made it into the air, according to The Santa Rosa Press-Democrat. The airport is home to the Comparative Aircraft Flight Efficiency Foundation, which organized the competition with NASA. 3 things. first, 2nd law of thermodynamics, you WILL not get back as much energy as you put in. ie, photovoltaic cells will not be sufficient, I don't care how efficient you make them. secondly, the shortage we have on minerals such as neodymium and lithium (both needed for this sort of thing) makes it look like we have enough fossil fuel to bathe in. thirdly, a nuclear power plant produces about 10 liters of waste anually, and much of that is recycled and re-recycled as plutonium. it's simple science here folks. Yes, you never get as much energy out as you put in, BUT, a conventional internal combustion engine is only around 25% efficient at converting fuel into mechanical energy, the rest is wasted as heat. Neodymium needed for the magnets in the motor and lithium in the batteries is not consumed like a fuel and can be recycled and reused at end of life. It's not the end all, be-all savior of the world but technology like this is exactly what we need to make a difference. Perhaps that is the reason we are examining the composition of the Moon and Mars. Open your mind. We've killed our planet. A new industry for the planetary future of our species. Would like to see this unit. These things always look great today, but they never seems to get past the 1-, 2-, 3-, 4-person stage. We need a Boeing 787 Dreamliner with this proportional fuel efficiency. Popluar Mechaincs magazine has been showing similiar planes for 60 years. And backpack jet pakcs. Where's my jetpack? And where's George Jetson? JAAAAAAAANE ! Taurus??... They like totally ran out of ideas? At least they could call it Prius to emphasize dual power. Taurus is a plane the company already makes, this one is made of two Taurus hulls on one wing. This plane is perfect for the mother-in-law that you don't want to sit beside!!!!! 🙂 Put her on the opposite fuselage and your problems are over, well, at least for the duration of the trip!!!! That is a good point....just joking. I am not that negative on mother-in-law, many of them are very nice ladies. It is better to read something that makes one laugh rather than those jealous, cynical comments posted by some stupid folks. I don't wear pants when I fly. There is no point. Plus, when I break wind, it makes things go a bit faster. A true tailwind! Max clocked GND SPD? Congratulations to those who succeed. Impressive !! This is aviation history. Darn Good Job !! Please explain why it needs two fuselages? Larger wingspan/distribution of weight? Thank you.. Better weight distribution, plus they only had a few months to build the plane from scratch, so they took an existing design and fitted two of it's hulls together. My mother went on date with Pipistrel owner Ivo Boscarol. Unfortunatelly she doesn't like to fly so there was no real connection between her and Ivo. Planes are to dangerous creatures that can cost you life. To all who mistakenly think thi is an USA achievment : the plane was constructed in the Pipistrel Co. Ltd in Ajdovscina, Slovenia (EU) : http://www.pipistrel.si. Similar planes already won 2 NASA prizes in 2007 and 2008. Regulations demands caused this mistake. The second prize went to Germany but the plane components also came from Pipistrel Slovenia. So much about US introvertism. Pipistrel is Slovenian (EU) company and not a company from Pennsylvania. This is Slovenian company not USA! Repair mistake CNN! while you barely mention Slovenia in your news story, here are some facts. The winning airplane was developed and built in Slovenia. Company Pipistrel is from Ajdovščina, Slovenia. The man behind this fantastic achievement is Slovenian Ivo Boscarol (founder, CEO and owner of Pipistrel) with his Slovenian team. The second place was claimed by the team E-genius of the University in Stuttgart, Germany. Pipistrel has been team E-Genius’s development partner. Their aircraft is actually a modified Pipistrel Taurus (wings and fuselage) with a specially developed tail section and an electric propulsion system in the tail. The electric motor was designed and manufactured especially for the e-Genius by the Slovenian (yes, again) company Sineton. It is the best time to make some plans for the long run and it's time to be happy. I have learn this publish and if I could I desire to recommend you few attention-grabbing issues or advice. Maybe you can write subsequent articles referring to this article. I want to learn more issues approximately it!